A displaced Malian woman prepares dinner for her family in the capital, Bamako. The latest round of military clashes over the weekend between the Malian army and radical Islamist groups have sparked a new wave of displacement and led to a worsening of the humanitarian situation in the North African country, the United Nations warned today. According to the UN Office for the Coordination of Humanitarian Affairs (OCHA), more than 30,000 people fled their homes over the weekend, coinciding with the declaration of a state of emergency by the Government and the beginning of a French air operation in support of the Malian army, bringing the number of internally displaced persons (IDPs) to over 200,000. “The degradation of the sanitation, shelter, health and food security conditions which has been observed over the last nine months in the North is likely to be aggravated as the number of IDPs increases,” OCHA spokesperson Jens Laerke told reporters in Geneva. Northern Mali was occupied by radical Islamists after fighting broke out in January 2012 between Government forces and Tuareg rebels, after which the country underwent a military coup d’état, in March. The renewed fighting comes at a time when OCHA estimates that 4.2 million Malians will need humanitarian assistance this year. These include some 2 million food insecure people and hundreds of thousands of malnourished children. The Office of the UN High Commissioner for Refugees (UNHCR) stressed that it is becoming increasingly difficult to access areas in the North as fighting continues. In Bamako, the capital, many families are struggling to make ends meet as the security situation deteriorates. “Many families live in small rooms in bad conditions with no electricity or direct access to water. They generally lack space to accommodate all family members. The needs for money, food and shelter are huge,” said UNHCR spokesperson Adrian Edwards, adding that the agency is in the process of working with partners on income-generating activities to ameliorate the situation. UNCHR is also assisting Malians who have left their country for neighbouring Niger, Burkina Faso and Mauritania by providing clean water, sanitation and hygiene structures, healthcare and education. “Refugees are telling us they fled the ongoing military intervention, the absence of subsistence opportunities and basic services, and the imposition of Sharia Law,” Mr. Edwards said. He added that UNHCR remains short of funds for the Mali crisis with only $77.4 million received of the $123 million sought to help refugees and IDPs in 2012. For 2013, the agency anticipates needs at a further $195.6 million. Meanwhile, the World Food Programme (WFP) warned that chronic problems of food insecurity and malnutrition in the country will only be worsened by the conflict. The agency has so far managed to move emergency food to 270,000 conflict-affected people in the North, including 70,000 IDPs. However, it states that persistent insecurity is severely limiting its work. WFP spokesperson Elisabeth Byrs added that the agency would continue to monitor the situation and work closely with its partners to reach more than 400,000 crisis-affected people in the cities of Timbuktu, Gao and Kidal, which have been some of the most affected areas. As the number of displaced people increased, there is also a growing concern for children as they are at high risk of being separated from their families and are more vulnerable to many forms of abuse, including military recruitment and sexual violence, noted the UN Children’s Fund (UNICEF). In anticipation of military operations, Ms. Bokova mobilized the agency’s Emergency Fund to protect the four sites in Mali that are inscribed on UNESCO’s World Heritage List. Efforts include developing preventive measures and the training of armed forces on the prevention of illicit trafficking. UNESCO has already provided the topographic features relative to the location of sites to the concerned military staff, as well as information for soldiers to prevent damage to cultural heritage. The information has been shared with police and aid workers. “Mali’s cultural heritage is a jewel whose protection is important for the whole of humanity. This is our common heritage, nothing can justify damaging it. It carries the identity and values of a people,” Ms. Bokova said. “The destruction of World Heritage sites in Mali in 2012, especially the mausoleums in Timbuktu, sparked a wave of indignation across the world, helping to raise awareness of the critical situation facing the Malian people. The current military intervention must protect people and secure the cultural heritage of Mali,” she added. 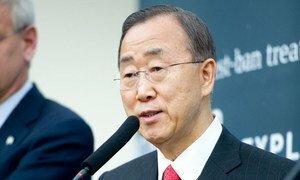 United Nations Secretary-General Ban Ki-moon today welcomed the response of “bilateral partners” to the plea for assistance from the Government of Mali to counter the troubling push southward by armed rebels, some of which are associated with terrorists groups.